This entry was posted in data analysis, english, Half-baked ideas on December 1, 2011 by janlo. Today, Thomas Metz made me aware of a dataset about ministers in Eastern German federal states (Bundesländer) by Sebastian Jäckle. The dataset includes the variable “duration of incumbency” in days for 291 ministers between 1990 and 2011. I was curious to look at the distribution of duration with the intention to be brave as a physicist and infer a simple stochastic model which reproduces that distribution. I copied the duration data into a matlab vector duration, made histograms, fits for different distributions and KS-Tests. As duration is a discrete random variable (days starting from inauguration), distributions living on the nonnegative integers are the natural candidates. The classical one-parameter distributions Poisson and geometric failed to deliver fitting distributions, but the negative binomial (NB) did surprisingly well. 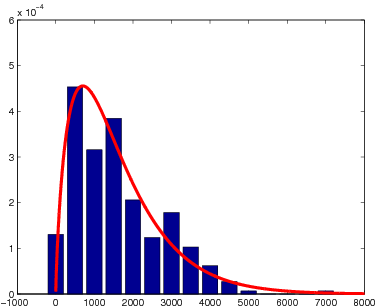 Normalized histogram for duration of incumbency and best-fit negative binomial probabilty mass function. What model does this imply? Looking at the days in the incumbency of a minister. Let us assume that every day can either be a success or failure which happens with probability . The negative binomial is the distribution of the number of successful days until failures occur (there is an extension to non-integer number of failures). Our model is thus, that a minister’s incumbency ends after a certain number of failures (what ever that means in practice). The best fit suggests that under this model 1.79 failures are allowed during a minister’s incumbency and that failures are relatively rare events happening with probabilty 0.11% every day, i.e. on average the first failure happens approximately at day 900.